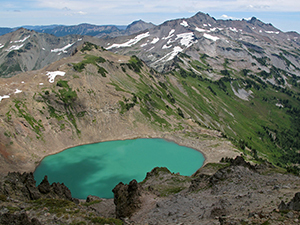 The United States Congress designated the Goat Rocks Wilderness (map) in 1964 and it now has a total of 108,023 acres. All of this wilderness is located in Washington and is managed by the Forest Service. The Goat Rocks Wilderness is a portion of the volcanic Cascade Mountain Range in southwestern Washington located between Mt. Rainier and Mt. Adams. The Goat Rocks are remnants of a large volcano, extinct for some two million years. Glaciation and erosion have worn away at the terrain here, leaving moderate summits on both sides of the crest of the Cascades. The elevation in the Goat Rocks ranges from 3,000 feet to 8,201 feet at Gilbert Peak. The deep east-west drainages below the ridges often open into park-like alpine meadows dotted with small lakes and even smaller ponds. Annual snowfall typically equals more than 25 feet, not melting entirely until late July or early August and keeping the ponds and lakes full when it does give in to the sun. Pikas and marmots scurry about above timberline, while the more reserved deer and elk have been spotted lower down. Mountain goats frequently show up in the higher country. Much of the 120-mile trail system stays on the ridges at or above timberline. The Pacific Crest National Scenic Trail (PCT) wanders north-south through the middle of the Wilderness for 31.1 miles, past 7,930-foot Old Snowy Mountain, where glaciers persist. Approximately 14 other trails climb to eventually join the PCT. Planning to Visit the Goat Rocks Wilderness? How to follow the seven standard Leave No Trace principles differs in different parts of the country (desert vs. Rocky Mountains). Click on any of the principles listed below to learn more about how they apply in the Goat Rocks Wilderness.